The great State of Michigan has a storied history in outdoor activities and conservation efforts. To commemorate significant chapters in our State’s outdoor heritage, the Michigan Outdoor Writers Association (MOWA) has established a series of markers—called Michigan Heritage Memorials—located state-wide. Each memorial celebrates a specific event which has made a lasting impact on our State’s accomplishments in conservation and recreation. Additionally, the memorials honor the individuals responsible for those efforts. The sites are located along our highways and byways, stretching from Lansing all the way to the western Upper Peninsula near Champion, Michigan. In 1969 MOWA established its first marker on highway M-77 in Blaney Park, in the Upper Peninsula. This first Michigan Heritage Memorial commemorates the group’s founding fathers. These dedicated outdoor writers demanded that MOWA members strive for responsible and effective outdoor communication—always keeping a watchful eye on our State’s natural resources. Today the group has about seventy members. MOWA was established in 1944. Dedication ceremonies for the Heritage Memorials generally occur during the Association’s annual summer meeting. Sites consist of either a bronze-cast plaque set in a large boulder, or a beautiful carving etched in majestic granite. Funding for these markers comes entirely from MOWA’s budget. All of the events and sites, listed below, were selected by the group’s Heritage Selection Committee. There are eight sites, to date, with others planned. Presently Heritage Memorials are located in or near the following Michigan localities: Lansing, Mayfield, Grayling, Atlanta, St. Igance, Blaney Park, Ishpeming and Seney. 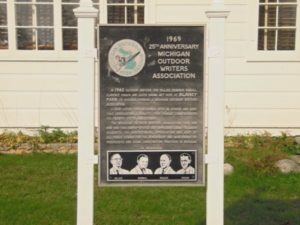 Michigan’s outdoor heritage is celebrated and commemorated at these locations and is important to us all. Visiting these memorial sites will be time well-spent and the scenic views en route are, in fact, pure Michigan. Day trips to these Heritage Memorials will provide you and your family with a fresh, proud sense of Michigan’s history as it relates to our State’s exciting and historical outdoor heritage. For the upcoming travel season, be sure to plan several trips to the seven Michigan Heritage Memorials established by the Michigan Outdoor Writers Association. Each site is listed below with driving directions and please note that all sites are easily accessible. 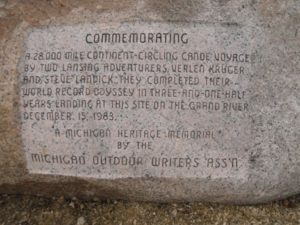 Commemorating the 28,000 mile North American Continent Canoe Voyage, located in Adado Park on the Grand River in downtown Lansing, Michigan. This site commemorates the epic canoe voyage by Verlen Kruger and Steve Landick, both from Lansing, who landed here on December 15, 1983. Direction to site: Follow Grand Avenue north to E. Shiawassee Street. The Park is located along the Grand River between E. Saginaw and E. Shiawassee streets. It is a very short walk to the memorial, located near a large foot bridge and canoe access site. Parking is limited at Adado Park but there is a city parking deck on the west side of the park. 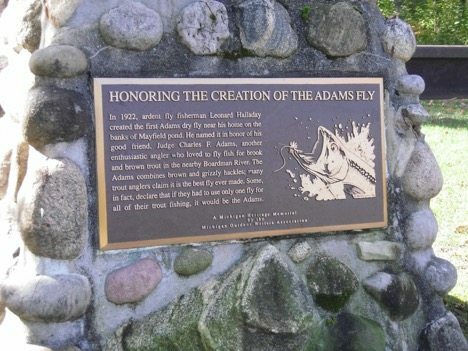 The Adams Fly—located in Mayfield, Michigan (near Kingsley and Traverse City). 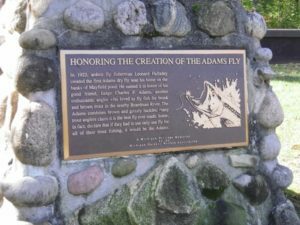 Commemorating the creation of the Adams Trout Fly located in the community of Mayfield, Michigan. Leonard Halladay created the first Adams dry fly here in 1922. This marker is located in Mayfield Pond Park. Driving directions: From Kingsley, follow Garfield Road into the community of Mayfield. Turn left onto Church St., then go right on Main St. Follow Main a short distance to Mill St., turn left and you will be at Mayfield Pond Park. The marker will be on your left near a cobblestone wall and the Halladay family homestead. There is ample parking in the park. 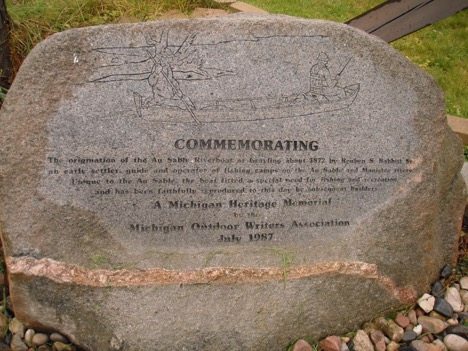 The Au Sable Riverboat Heritage Memorial, in Grayling—commemorating the origination of the Au Sable Riverboat circa 1872—a boat especially designed and built for fishing on the Au Sable River. The memorial was placed and dedicated in July 1987. Driving directions: Follow Business Route U.S. 27 into downtown Grayling. This marker is located on the west side of the Old AuSable Fly Shop, 200 Ingham Street, in Grayling,across from the city park and the Chamber of Commerce building. 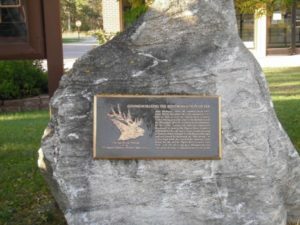 Commemorating the Reintroduction of Elk in the Pigeon River Country, located in Atlanta, Michigan. Rocky Mountain Elk were released in 1917 to re-establish the presence of elk in this area. The effort was successful and a large herd thrives to this day. This Heritage Memorial is located in front of the U. S. Post Office in Atlanta. Directions to site: Travel east on from Gaylord on M-72 about 34 miles to Atlanta. Continue east through the blinking light; the Post Office in on the left or north side of the road. There is an Elk Herd information booth at this site that offers additional facts about this majestic animal. In Commemoration of Thousands of Great Lakes Shipwrecks and Michigan’s Underwater Preserves, St. Ignace. 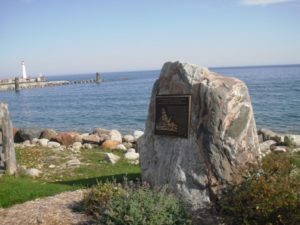 This Heritage Memorial site, dedicated in 1994, is located at the American Legion Park on State Street, just past the very large and colorful “Welcome to St. Ignace” sign on the Lake Huron side of State St.
Driving directions: After crossing the Mackinac Bridge, take the St. Ignace exit 344 which becomes State Street. Continue east on State to the American Legion Park site along the lake. 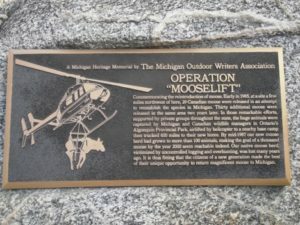 In Memoriam of the Founders of the Michigan Outdoor Writers Association, in Blaney Park, Michigan. Pictured on this marker are the founding fathers of the Michigan Outdoor Writers Association: Don Gillies, Kendrick Kimball, Clarence Paquin and Lloyd Egan, who met at this U. P. location in 1943 and discussed forming an outdoor writers group dedicated to this goal: “to labor diligently for understanding, appreciation and, most of all, public demand for the achievement and maintenance of progressive and sound conservation practices in Michigan.” This memorial was dedicated in l969 to honor the group’s 25th anniversary and the formation of MOWA in 1944. Driving directions: Located just one mile north of the U.S. 2 and M-77 intersection in the Upper Peninsula, this marker rests in front of the Blaney Inn. 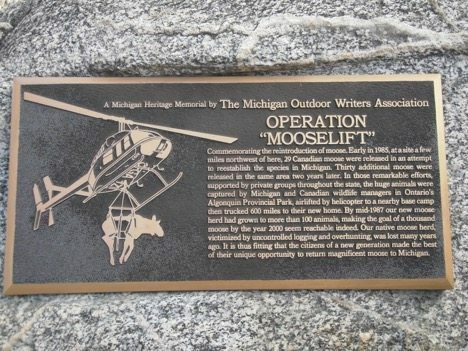 The Operation “Mooselift” Heritage Memorial marker commemorating the reintroduction of the Canadian moose to the Upper Peninsula in 1985. This marker is located inside Van Riper State Park on Lake Michigamme and rests about 50 yards west of the main park entrance next to a special moose information kiosk. Driving directions: Go west from Ishpeming on U.S. 28 Ishpeming, to Champion. Stay on U.S. 28—Van Riper State Park is located 3 miles west of Champion. 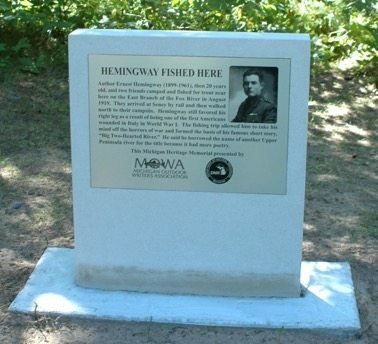 Author Ernest Hemingway (1899-1961) then 20 years old with two friends, camped and fished for trout here on the East Branch of the Fox River in August 1919. They arrived in Seney by rail and then walked north to their campsite. Hemingway, still favored his right leg as a result of being one of the first Americans wounded in Italy in World War 1. The fishing trip allowed him to take his mind off the horrors of war and formed the basis of his short story, “Big Two Hearted River.” He said he borrowed the name of another Upper Peninsula river for the title because it had more poetry. Marker is located in the State Forest campground on the East Branch of the Fox River 7 miles north of Seney on M-77.